Hexagon Outdoor 2 Tier Fountain Bird Bath Garden Yard with Solar Pump and LED Lighting. 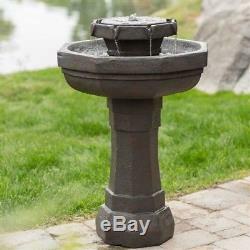 This Hexagon Outdoor 2 Tier Fountain Bird Bath with Solar Pump is Crafted of Resin and Fiberglass in a Dark Stone Gray is Perfect for any Space in your Garden or Yard. Featuring a Solar Panel with a Rechargeable Lithium Battery, this Fountain Bird Bath has a Submersible Solar Pump that Recirculates the Water to create a Continuously Soothing Environment. Four Solar Powered LED Lights Complete the Package, giving this Fountain an Alluring Glow in the Evening. Hexagon Outdoor Water Fountain Bird Bath with Solar Pump and LED Lighting. Crafted of Colored, Painted Dark Stone Gray Fiberglass and Resin. Solar Brushless Pump Included, Flow 200 LPH. Water Recirculates via Solar Powered Submersible Pump. 6V, 2W Solar Panel with Rechargeable 3.7V Lithium Battery. Illuminated by 4 LED Bulb Cluster in Warm White. Dimensions: 20.4" L x 20.4" W x 29.6 H. Excellent Addition to Garden/Yard or Gift. Must have an RA number. The Dimensions of this Stone Gray Fountain Bird Bath are 20.4" L x 20.4" W x 29.6 H and Weighs 19lbs. 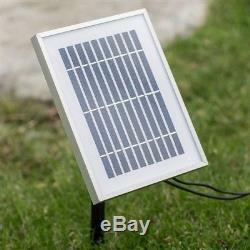 Included is a 6V, 2W Solar Panel with Rechargeable 3.7V Lithium Battery. 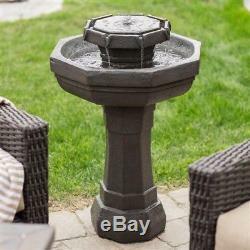 This Hexagon Outdoor Stone Gray 2 Tier Fountain Bird Bath with Solar Pump and LED Lighting would be an Excellent Addition to your Yard or Garden or a Special Gift. The item "Hexagon Outdoor 2 Tier Fountain Bird Bath Garden Yard Solar Pump LED Light Decor" is in sale since Wednesday, May 9, 2018. This item is in the category "Home & Garden\Yard, Garden & Outdoor Living\Ponds & Water Features\Outdoor Fountains". The seller is "coveredbridgetn" and is located in Walnut, California. This item can be shipped to United States.